Rainbow Creek Station: Two public washrooms: one for men and another for women. They are wheelchair friendly and each has a baby changing table. A concession which serves hot and cold beverages, hot dogs, chips, candy bars, ice cream sandwiches and fudgesicles, and engineer caps, wooden whistles and hat pins. 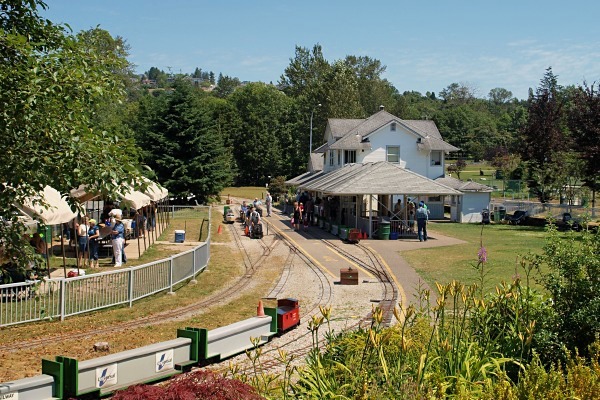 A small museum featuring photos of full-sized as well as miniature locomotives, other railway memorabilia, and a number of miniature engines. The outdoor public area: A large birthday party area. Picnic tables, many are under an awning. A grassy picnic area for the use of our passengers. The Chevron lookout which allows visitors to observe trains on 3 sections of mainline track, as well as the station yard.